Equipped with Bluetooth connectivity, live digital traffic updates and voice-activated navigation , the Garmin Nuvi 2599LMT provides you with optimal navigation features in a sleek , beautiful design. 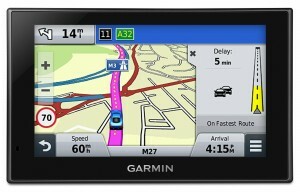 The screen that comes with this sat nav features a dual-orientation that makes for vertical or horizontal views. It does also incorporate a pinch and zoom function that makes for closer readings when the need arises. It comes with a has a bright 5.0-inch display and boasts of dual-orientation to enable you use the sat nav either horizontally or vertically. It features a Garmin Real Directions function complete with spoken instructions and recognizable buildings, landmarks, and traffic lights. With this convenience present, the need to physically look out for street names is eliminated. You can also quickly find addresses for millions of points of interest using key phrases or parts of addresses thanks to the advanced search guide on the sat nav. 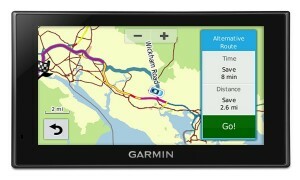 The Gamin 2599LMT comes with free Lifetime Maps for the UK, Ireland and Europe to enable you navigate to your destination with ease, even if the roads have changed. In order to make for a pain-free updating experience, the sat nav makes use of the Garmin Express software that facilitates the installation of free custom vehicles and voices. You are able to find addresses and millions of points of interest such as restaurants, supermarkets and cash machines among others thanks to huge POI database. In case you are navigation to a particular destination that you are not that familiar with, thanks to 3D representations of select buildings, terrain aspects and landmarks on the sat nav’s screen, you can easily figure out where you are. 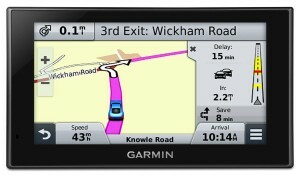 In addition, Garmin also incorporates a number of other helpful visual tools to enable you stay on the right path; it makes use of tools such as Active Lane Guidance, Bird’s Eye junction view for a more detailed look at complicated interchanges from above and photoReal junction view that provides you with realistic images of intersections, inclusive of signs and surrounding terrain, complete with colored arrows for the right lane. The nüvi 2599LMT also comes with Garmin Real Directions complete with Garmin Real Voice, a combination that helps keep you relaxed as you drive. With the Real Directions voice prompt, directions are spoken to you in a friendly natural sounding human voice. This makes it easier for you to readily comprehend the directions that are being spoken to you thanks to the Real Voice technology. You can also enjoy accurate traffic updates and avoid annoying delays thanks to the Digital Traffic technology that comes with the sat nav. This free service delivers continuous updates to the side of your screen, with accurate pinpoints of any incidents and offers of alternative route suggestions. Last but not least, the sat nav comes loaded with the Cyclops Speed Camera system that aids in the provision of real-time alerts of camera locations as you approach them. It incorporates the full current speed camera database and provides you an opportunity to update the device with the latest camera locations.